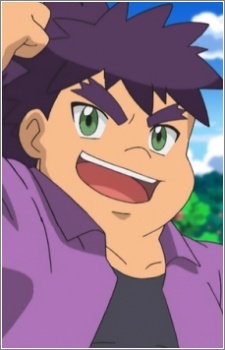 Rodney (Yukiya) is a character of the day who appeared in The Journalist from Another Region!. Rodney was first seen in the episode when Ash was running to a food stand. Both Trainers bumped into each other, with Rodney mocking Ash into believing that he would win the Pokémon Sumo Tournament. This caused a rivalry between the two Trainers. During the tournament, Rodney went up against Meowth who was disguised as a Golem. Rodney was not fooled by the disguise and easily defeated the trio, sending them blasting off in the process. Since then, Rodney managed to get through the tournament and made it to the final round where he faced his new rival, Ash. He lost after Pignite defeated Golurk. Even though Ash won, Rodney was given a split apple from Ash, similar to what a Beartic and an Ursaring of Harvest Island folklore had done.